You may or may not know, but I used to be a high school English teacher. I left for a few complicated answers; the primary reason being my migraines. I don’t miss getting up before 5 in the morning or the late nights tweaking lesson plans or the Sundays spent grading hundreds of papers. Teaching is stressful and such hard work! The thing that I truly miss the most – more than anything else – is the community of teachers. I had the privilege of working with some ALL STAR teachers who truly inspire teachers! Here is the thing though – teaching is a fairly thankless job. Teachers are often attacked in the news while at the same time having higher levels of responsibility, students, work, and education requirements placed on their shoulders. Now, that’s not to say their aren’t great PTAs or parents out there who are rooting for teachers. I just don’t think they can EVER hear it enough. Why not take a little time out of your day to give a teacher in your life a little extra love – which in teacher talk means supplies!! 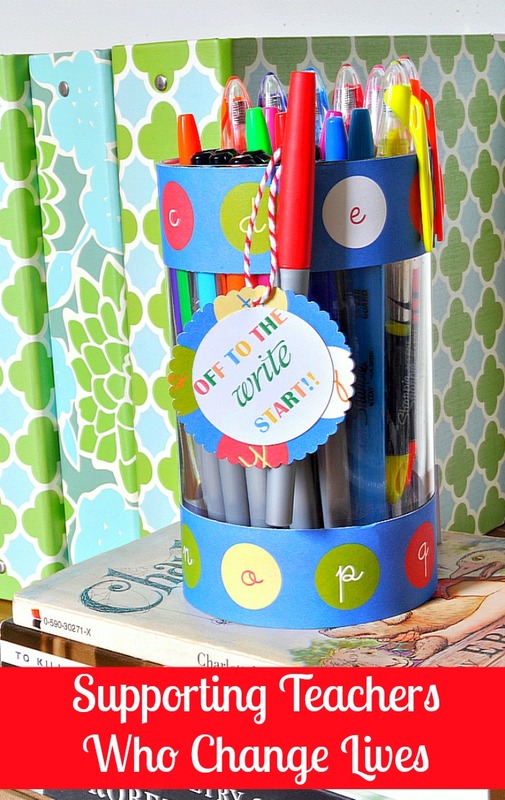 Teachers love having good supplies and usually spend a LOT of their own money buying them. I know in my old department, we loved color. Fun colors to grade papers with or organize our planners. Plus, we never had enough highlighters to use in the classroom. 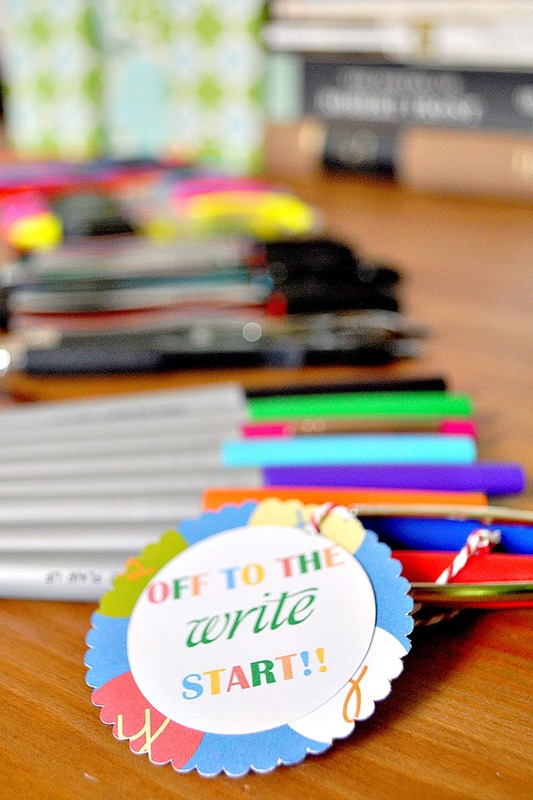 So take this opportunity to help a teacher begin the year “off to the WRITE start” and spread some love! I went to Office Max and bought PaperMate Flair Ultra Fine Markers and Sharpie Pens. These were both my absolute favorites to use when I was a teacher for grading papers. I use them now in my planner and in my business. I also bought a pack of uni-ball Signo pens and a large collection of Sharpie highlighters. Then, I took a large glass vase that I already had in the house as well as scrapbook paper with letters on it. I cut the paper into little strips for the top and bottom of the vase, attaching the paper with double sided adhesive. 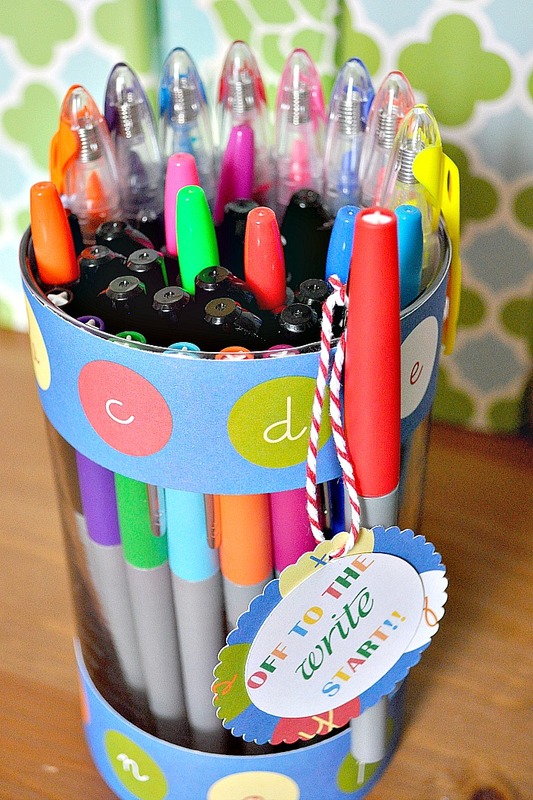 It was an inexpensive but cute way to add a little fun decoration to the gift. Lastly, I used the same letter paper and white card stock to make a themed sign for the gift. I used Word to type out “off to the WRITE start” and then cut the words out with a circle cutter. I used my Silhouette to cut out a scalloped circle, but you wouldn’t need to do this. You could cut out a square or another circle. I punched a whole and used baker’s twine to tie the tag to one of the pens in the jar. 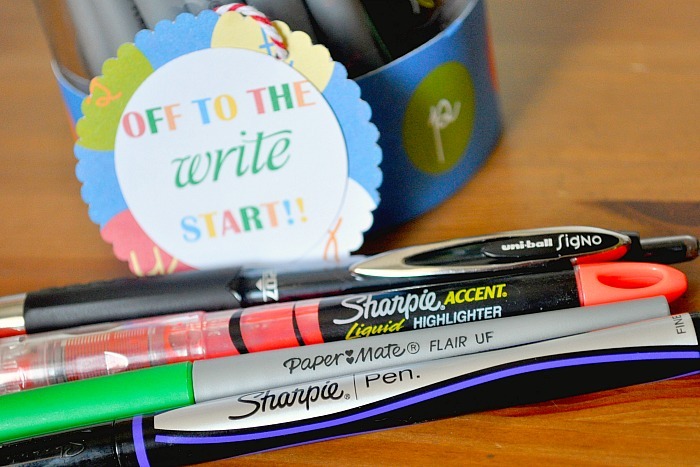 You can SAVE $5 off your purchase of $20 or more on select Newell Rubbermaid Brands while supplies last at Office Max and Office Depot (PaperMate, Expo Neon Window Markers, Sharpie, uni-ball, and Mr. Sketch). Don’t forget to sign up for the rewards program at Office Depot, which is also good for Office Max as they are now owned by the same company! Who is the teacher in your life? !